Do not replace the spiral cable with the battery connected and the ignition switch ON. 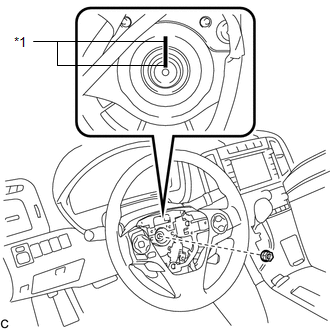 Do not rotate the spiral cable without the steering wheel with the battery connected and the ignition switch ON. 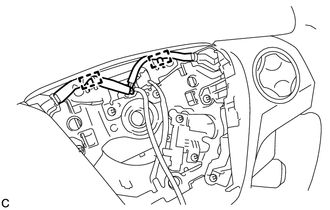 Ensure that the steering wheel is installed and aligned straight when inspecting the steering sensor. (a) Install the steering shake damper to the steering wheel sub-assembly with the 2 screws. (a) Engage the 2 claws, 2 pins and 2 guides to install the steering pad switch assembly. (c) Pass the wire harness over the 2 guides. (a) Install the steering wheel assembly aligning the matchmarks on the steering wheel assembly and steering main shaft. (b) Install the steering wheel assembly set nut. (c) Connect each connector to the spiral cable sub-assembly.